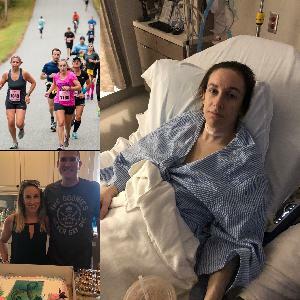 In March of 2018 I was diagnosed with metastatic papillary thyroid carcinoma. I was fortunate enough to have a friend who works at MSK and convinced me to get treatmeant there. Every single person I dealt with at MSK was amazing. They made one of the scariest times in my life a lot easier to deal with. I had my thyroid removed and then I had Radioactive Iodine Therapy to remove/shrink whatever cancer was left in my lymph nodes since it had spread. I still have a tiny bit left in me, but the hope is that the radiation will do its job and get rid of the rest. If not, I am confident the fine folks at MSK will go back in and remove it. I have run twenty marathons, but never have I run one to raise money for charity. I've decided to run for Fred's Team this year. Any donations I receive will go to the Aubrey Fund for Pediatric Cancers. While I am fortunate enough to have the "good cancer", meaning it is slow growing and has a high survival rate, I know how terrified I was when receiving this diagnosis. During my visits to MSK I would see the pediatric patients and think if they can do this, then so can I. I would look at their parents and I thought to myself - I will take the cancer that I have and the pain that I am going through a million times over if it would protect my children from ever having cancer. I saw how brave those children were and are and it is my wish and hope to find a cure for all pediatric cancers.